The TITAN EG800 Manual Board Edger is designed to offer a twofold solution to small and medium-sized sawmills. This robust machine edges material up to 40mm thick at high speeds, making it the ideal companion to the TITAN Resaws. 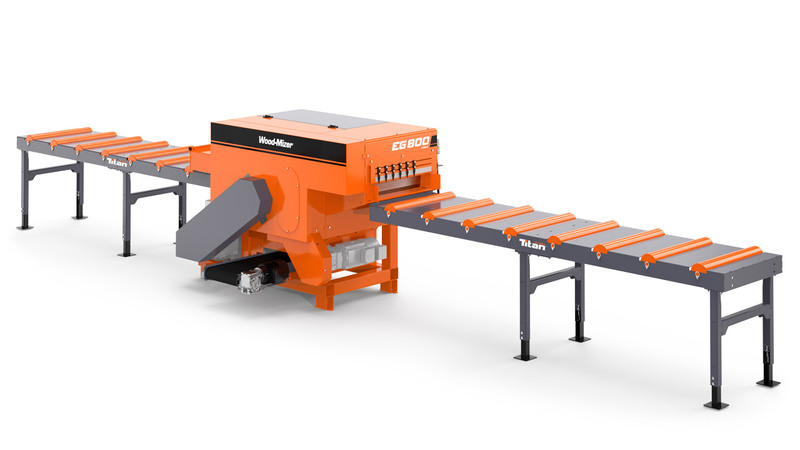 It can also be run at slower feed speeds to rip material up to 110mm thick, making it an affordable alternative to a Gangsaw. Consequently, this TITAN product is a truly versatile machine. This machine’s primary function is to edge boards received from a resaw or a QVS (quad vertical saw). The wide arbour can be packed with multiple blades. By aligning the incoming board accordingly, it is possible to achieve a multitude of product sizes, simply and affordably. Whichever its intended use, this versatile machine is incredibly robust and easy to maintain. An affordable, hardworking solution for any mill!